We were a little unsure about how much we could accomplish in such a short period of time, but we got to work immediately. After getting the walls painted, we moved on to installing the laminate flooring. Yes, my heart was broken that we didn't have the time to restore the original wood floors, but the difference made by adding the laminate was like walking into a new home! 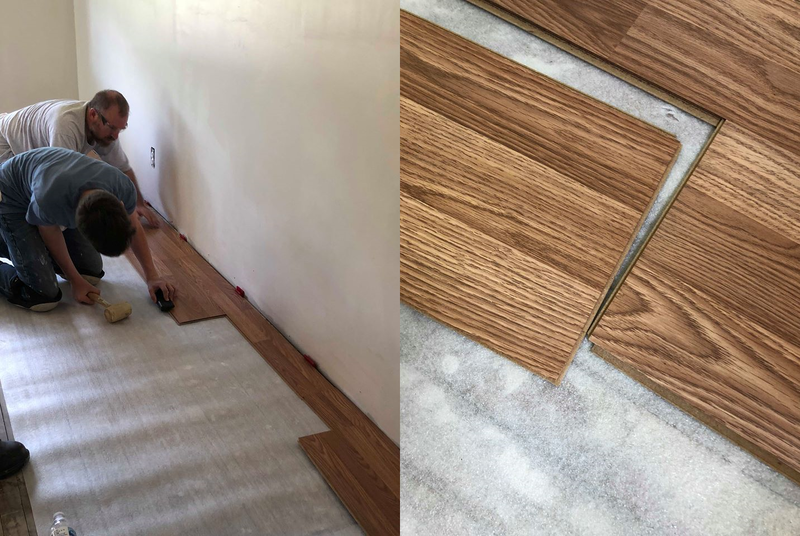 I never thought installing laminate flooring was something I could do on my own, but after installing them in this home, I realized I could totally take on this project! But for real, this project isn't "building your own treehouse" hard, but it's definitely more difficult than many other DIY projects. This will take time, patience, and the ability to manage a saw. If this sounds scary, enlist the help of a hubby, teenage child, or another DIY diva. Two people will make this job move much faster. 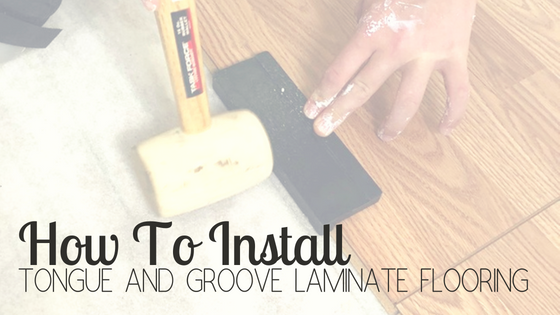 -This is tongue and groove floating laminate flooring. Floating means that it isn't attached to the floor beneath in any way. 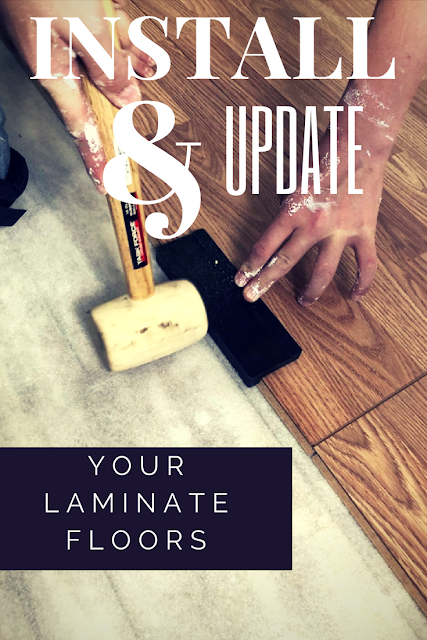 -When you buy laminate, expect that ten percent will end up being wasted by cutting and trimming. So if your room is 100 sq. ft., buy 110 sq. ft. just to be safe. 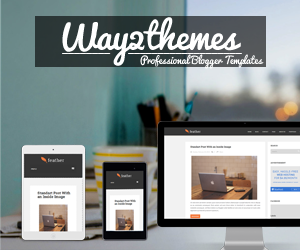 -The kit easier than buying each piece separately. Here's an example of the kit for only $15! So your first mission is to make sure the floor is clean and flat. 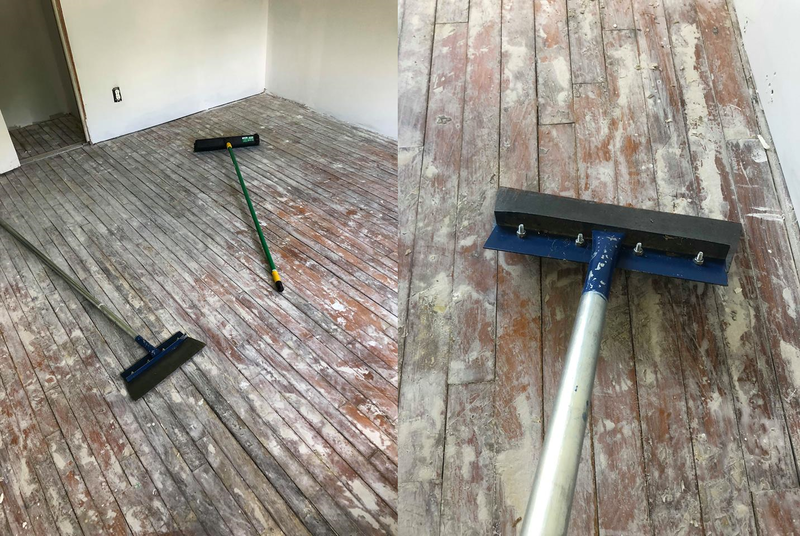 You may have to scrape up any excess left from the previous flooring or any spackle or paint that may make the flooring undulated. Hopefully, you won't need to do as much scraping as I did! Then, sweep up the excess. Next, measure the wall to see how many boards you will need and to what length you need to cut the board to fit in the room. Make sure the groove (the part that doesn't jut out) of the tongue and groove buts up against the wall. The first length of the wall is the most important because it sets the stage for the rest of the room. Once you have your pieces cut to fit the first line against the wall, you need to attach the boards together. This part is the most satisfying! Start on the wall opposite the door and lay down your first board (groove side facing the wall). Make sure to place spacers between the wall and the board. 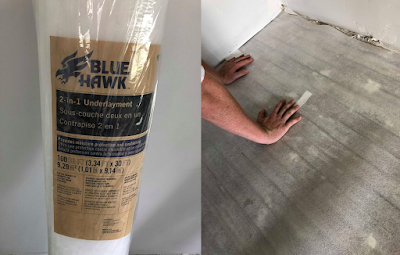 These prevent warping when the laminate expands and contracts due to changes in humidity. Lay down your second board against the wall(remembering spacers) and fit it into the tongue and groove. 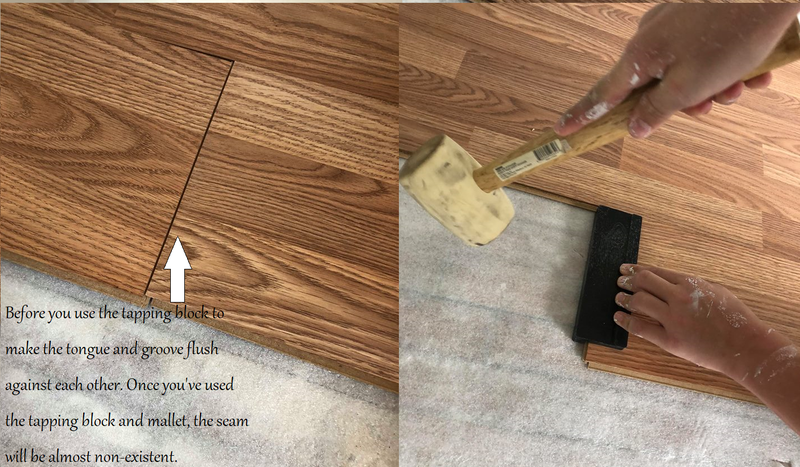 Place the tapping block against the end and tap it with the mallet until it is flush with the previous board. Once you have the first panels against the back wall, stand back and look at it. If it doesn't look straight, the whole room will look crooked. Stop. Fix the crooked spots. If the walls are not straight, you may have to trim the sides to make it fit against the wall. Keep working until it looks straight. The first length is the most time-consuming, but the rest of the flooring will move much more smoothly and look better if you take the time to get it right. As you keep cutting, trimming, adding, and tapping in boards, keep standing up and checking your room. If anything ever begins to look crooked, stop and fix it! Don't forget to tap on the end AND tap it into the previous row. What the what?! This is an amazing difference! The baseboards have also been added in this picture, which you will need to do and will cover many transgressions. 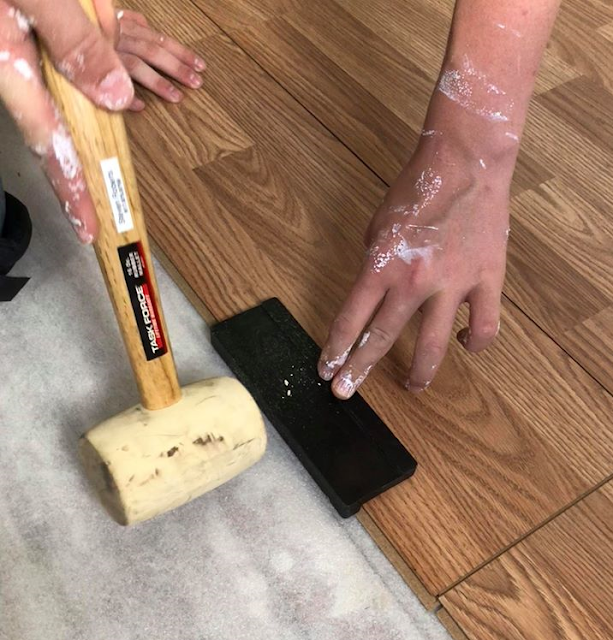 Make sure to remove the spacers between laminate and walls before installing baseboards. This is my first time to do this, but as a first timer (with a little expert help), I was pretty happy with the result and felt like the job was pretty reasonable. Do you have experience with this type of project? Did I leave out any important details? Leave reactions in the comments below! This is going to come in handy soon. We bought a fixer upper and have no idea what we are doing! You have really laid out the instructions clearly for installing this type of flooring. 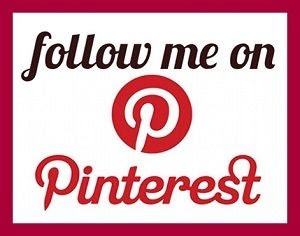 Pinned to refer back to as I want to remove the carpet from my office and will consider laminate flooring. We had been tempted to try this on our own, but ended up hiring it out to the experts. Thanks for sharing.